A priest who sexually assaulted seven children before spending more than two decades on the run in Spain has been jailed. 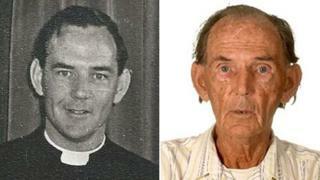 Francis Paul Cullen abused the boys and girls between 1957 and 1991, when he was a priest in Derbyshire and Nottingham. The 85-year-old pleaded guilty to 21 offences last month after being traced to Tenerife then extradited to the UK. At Derby Crown Court, he was jailed for a total of 15 years. Judge Jonathan Gosling told him: "You took full advantage of your position, and the trust in which you were held, to satisfy your perverted lust. 1991 - He retired from the church because of "ill health"
"It is impossible to reconcile the fact that you were administering the sacraments of the Catholic Church - baptism, confession, communion, confirmation - at the same time as you were indulging yourself with these children, some of whom served you on the altar at which you celebrated. "To say that you were a disgrace to your cloth understates your activity. This was gross hypocrisy. In a sentence, your entire life was a lie. "You were, in reality, cunning, devious, arrogant - in the word of one of your victims 'despicable'." The clergyman was due to go on trial at Derby Crown Court last month but admitted his guilt on what would have been the first day. Police believe there could be other victims who have not yet come forward. Cullen's youngest known victim was six years old, and his oldest was 14. They included five altar boys and two young girls, some of whom were in court for sentencing. Father Andrew Cole, Diocese of Nottingham spokesman, said the Bishop of Nottingham had asked the Holy See to "dismiss Cullen from the clerical state in view of him having pleaded guilty to the offences". Cullen will still technically be a priest, but will never function as one again, Father Cole said. The defendant fled to Tenerife in 1991 while facing charges of sexual assault brought by Nottinghamshire Police. He was born in Dublin, but he abused the children while working as a priest in Mackworth and Buxton, both in Derbyshire, and Hyson Green, in Nottingham. He also worked in Scunthorpe, Leicester and Alfreton.